Chinese gybes on windy days are a good spectator sport, but with the right prompt response they can be averted. In this article, I explain how they happen and what to do and when to avoid them. This type of accidental gybe is caused by the boat heeling excessively to windward. The centre of effort of the spinnaker also moves to windward, accentuating the angle of heel. As this happens, the boat starts to turn on her longer windward waterline edge and bear away on her own. 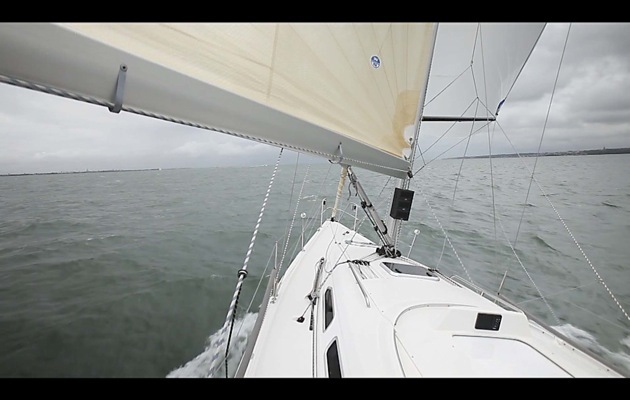 As the boat heels, the surface area of the rudder receives less water so steering is less efficient and you lose control, with the boat usually ending up flat on her windward side with the spinnaker pole in the water and the boom in the air. Inevitably, the point arrives when the force of the wind on the mainsail is no longer able to support the weight of the boom, now up in the air, and it comes crashing down. Here’s our video showing the whole process, which is detailed in full below. Your spinnaker is the biggest and most powerful sail on the boat; so you need to be the boss, depower it early and stop it from wandering around and excessively heeling the boat. Having the centre of effort of the spinnaker outside the footprint of the boat, giving windward heel, is not always a bad thing; but when the breeze gets up and the boat starts to roll, then it’s time to depower. Start by gently easing the pole forward and at the same time sheeting on. This will move the centre of effort of the sail back over the boat. It is important to do this simultaneously. Easing the pole forward rapidly and not taking in on the sheet, will simply cause the kite to swing round to leeward and could put you into a broach. Pull on your leeward tweaker or barber-hauler and oversheet the spinnaker slightly. This will have the effect of bringing the sail down towards the deck, flattening it a little and giving it less scope to wander around. Moving the pole down both on the mast and on the outboard end will also have the effect of ‘strapping’ the spinnaker down, so lowering the centre of effort and making it more stable. With an asymmetric, pull on the tack line. This will tighten the luff of the sail, stopping it from wandering and taking away some of the power. The mainsail’s job in this situation is to try to balance out the power in the spinnaker and remove windward heel. 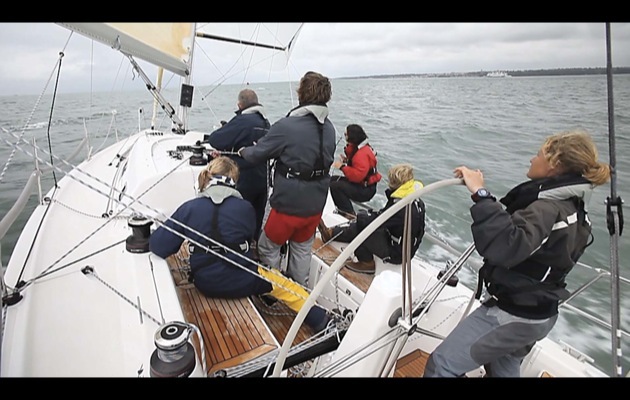 Pull on the kicker to keep the head of the main powered up; this maintains a counter force in the mainsail, pushing the boat back over to leeward and also stops wind spilling over the head of the mainsail and into the top of the spinnaker, making the situation worse. When sailing short-handed or on longer passages with a cross swell, you could consider using a preventer to keep the boom up in the air should you roll excessively. This could give you vital seconds to depower the spinnaker before the boom comes crashing down. But the preventer should be led forward then back to the cockpit, in a place easy to reach, so should the situation deteriorate, you can let it down quickly. When the boat starts to roll, it is easy to make it worse with excessive use of the helm. Try to keep the boat steady and make gradual changes – the rudder requires water to be flowing over it to steer so going full lock will simply stall the boat. Initially, try to steer the boat out of the roll – remember it is not necessarily because the boat has altered course that you are in danger of gybing, but because the boat is rolling to windward and the boom is up in the air. Gently steer the boat to a higher wind angle and try to sail flat or with slight leeward heel. A sudden rounding up could send you straight into a broach. Chinese gybes can be caused by difficult sea conditions, perhaps an old residual cross swell, but often they are an indication that the boat is starting to become overpowered. Recovery should be followed by an assessment of the conditions. Perhaps it is time to change to a smaller spinnaker or go with a poled-out headsail. Make sure your cockpit is ready at all times for a drop. 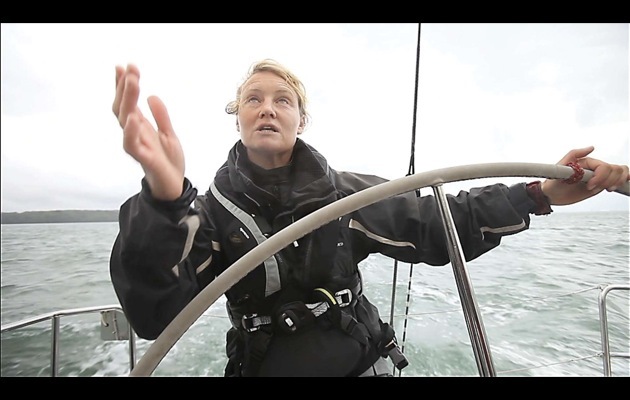 When short-handed sailing in marginal conditions, it can often be the autopilot that will Chinese gybe the boat. Most pilots have controls now which can be adjusted to help the unit react well to these conditions, by balancing response and counter rudder settings. However, simply programming the pilot to steer 5 -10° high of the course while you are off the deck will keep the boat safe. Do keep your cockpit clear so sheets and guys are always ready to go. Don’t over-react – rapid counter actions can cause you to go straight into a broach.